As summer rolls around, we all look for ways to escape the steamy city fug. Sometimes that means jetting off to one of our 7,000 (plus, plus) islands to lie on white beaches, sip chilled fruit drinks, and marvel at glorious sunsets. Other times it means packing a whole host of toys and snacks into our car and driving to the suburbs – to one of our friends who are lucky enough to have both a garden and a pool – for a much needed break from the heat that our concrete jungle so skillfully traps within its walls. The other week, with city-escape in mind, we were at friends’ house for swimming and barbecue. They have a wonderful home with spacious garden where the kids can run around, a pool where everyone can cool off, and a grill that looks like a little space pod. They also have a mango tree that produces the best Indian mangoes that are absolute magic with bagoong (shrimp paste). It is usually while lazing on a lounge chair under that tree, eating those mangoes with the aforementioned shrimp paste, listening to the birds we do not hear in our city flat, that C and I dream and wonder, for one glorious minute (or two), about packing it all in and moving to the suburbs. 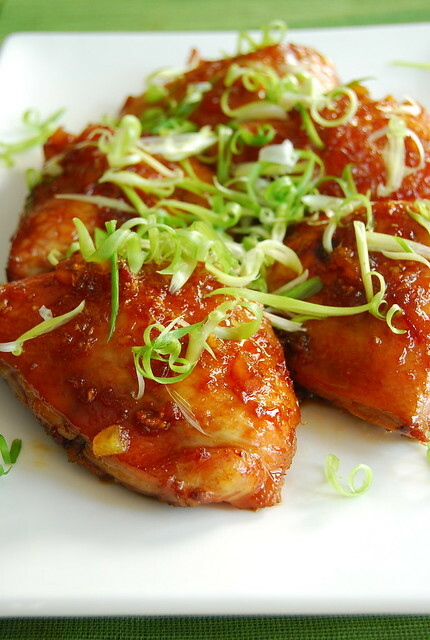 – In a bowl, mix together the marmalade, soy sauce, ginger, water, garlic, sesame oil, and chili oil if using. – Pat your chicken pieces with a paper towel until very dry. Place in one layer in a baking tray or pyrex dish. Pour about 2/3 of the marmalade mixture on top and save the rest for basting. Rub the marmalade mixture all over the chicken. – Place the chicken in a pre-heated 350F oven for about 45 minutes – 1 hour or until chicken is done (when there’s no pink in the juices when pierced), basting with the reserved sauce and pan juices about 2-3 times throughout. – When the chicken is done, transfer pieces to a platter. Transfer all the juices and sauce from the baking dish into a pan, together with any remaining sauce that you used for basting. Simmer rapidly for a couple of minutes or until slightly reduced. Serve alongside the chicken. The original recipe uses chicken breast fillets and pan fries them, and then adds the sauce to the pan, letting it bubble away for a bit. I didn’t have any breast fillets, but I always have chicken thighs hanging around so I used those. And because I prefer cooking in the oven rather than on the hob (because ultimately I am lazy) I decided to bake them. I’ll give myself plus points though because I used homemade marmalade (here’s the recipe). I loved how this turned out. Firstly, let me just say I could drink this sauce. Just from the first lick I knew I would like the finished product. It’s sweet, savory, sticky, and if you use the chili oil, can also have a bit of a kick. Basically all that I gravitate towards in a sauce. So, at that point, I was already sold. Added to that, it’s a breeze to make and quite thrifty too if you consider chicken being one of the most affordable meats here. This is definitely going to be made again…along with other variations: maybe with prawns next time (not so thrifty but we all deserve a splurge sometimes right??). There are more dishes I’ve bookmarked to try, like the World Cup Chilean Chicken and the Sunny Mango Sponge cake. What I like about this cookbook is its relaxed and approachable vibe. It focuses on the basic concepts of healthy eating without being too stringent about it, especially important and appealing I think for moms who, between work and family, have hardly a moment to cook. I also secretly like that it’s written by two Filipino moms – I love seeing more Filipinos out there, being published and sharing their great ideas with the world! Maybe I’ll be making one of these recipes for our next suburban potluck…let’s see! Until then, we are getting our sunnies on, whipping out the flip flops, and trying to stay cool! Hope you are all having a fantastic weekend! This looks like my kind of chicken recipe! I love spicy chicken food, I guess your chicken is spicy and it also looks so yummy.